What you can do using the status-bar. 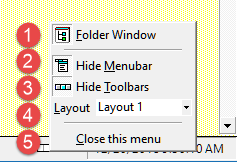 Toolbar button to show or hide Toolbars. Scroll Right or Scroll-Left to see hidden notepads.